This Pacific Floorcare S-20 automatic floor scrubber comes with a pad driver, two maintenance free lead batteries, and an on-board charger. This is a reliable and productive auto scrubber that is cordless, allowing to clean just about anywhere! It will lay your clean solution down, scrub, and then recover that solution in one pass. The brush driven head can also scrub with the squeegee in the up position for extreme cleaning situations, where the solution needs to be worked a few times, before recovery. A great example would be when stripping a floor, and the stripping solution needs time to do it's job. The polyethylene body holds up over time, and comes with a 10 year warranty. It also allows for fast, and easy access to the batteries and motors. We do have other models available like the S-20 orbital dry stripping machine from Pacific Floorcare that you may be interested in if this machine does not meet your needs. 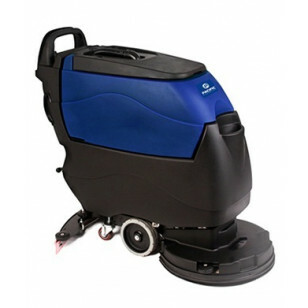 Here is a complete list of our Pacific Floorcare floor machines and walk behind floor scrubbers that are available if you're looking for less expensive options. The solution tank fill opening is at the front of the tank at the right height to use a bucket for refilling when there is not a hose available. Features maintenance free lead batteries, where no electrolyte ever needs to be added. Recovery tank can be lifted off and away from unit for easy access when servicing the machine. The heavy duty squeegee blades can be removed and changed without any tools. The scrubbing head is equipped a rotating brush, which can be lifted by a pedal, for easy machine transport, and brush change. The pressure, angle, and height of the squeegee can be easily adjusted. Two squeegee support wheels ensure smooth movement along your cleaning path. 3 year power train warranty.